Conventional Republicans have a lot of beefs with Donald Trump that range from charges of ideological heresy to fears that a President Trump would permanently damage U.S. global prestige. But as he gets closer and closer to the number of bound delegates necessary to lock down the presidential nomination, anti-Trump forces in the GOP are focusing more and more heavily on a more practical objection: He’s a sure general-election loser. Similarly, as Bernie Sanders gnaws away at Hillary Clinton’s big lead in pledged delegates for the Democratic nomination, his camp is anticipating the argument it will have to make to the hundreds of superdelegates who have earlier announced support for Clinton. In part it will be based on the argument that the pledged-delegate winner represents the will of the party “base.” But perhaps the louder argument — and the sole argument for Sanders if he falls short of Clinton in the pledged-delegate count — will be that polls show Sanders as a stronger general-election candidate. 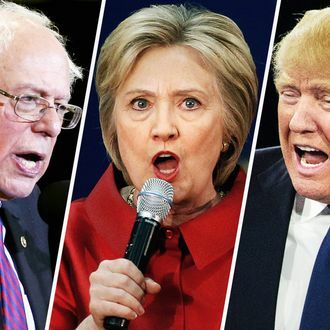 In other words, electability is about to become a big and unavoidable issue in both parties’ presidential nominating contests as they move toward an omega point this spring and summer. Its importance will be accentuated by the growing sense that this is truly a high-stakes election that will have large and immediate policy implications on a host of international and domestic issues. But the debate will be confounded by varying assessments of what is likely to happen in November with different candidates at the top of the ticket. The most obvious yardstick is the general-election trial heat, which is a feature of many national (and a few state) polls. The winnowing of the GOP field has made this data much easier to follow, and the polls pretty consistently (and despite the candidate’s contrary assertions) show Donald Trump trailing both Democrats by (usually) double-digit margins. Meanwhile, Bernie Sanders is pretty consistently running ahead of Hillary Clinton. In the RealClearPolitics polling averages, Sanders is leading Cruz by 8 percent and Kasich by one percent. Clinton leads Cruz by 3 percent and trails Kasich by 7 percent. Unsurprisingly, general-election trial heats figure prominently in Republican anti-Trump messaging. And the numbers do cause Trump — who famously cites his intra-party polling numbers constantly — some heartburn. Meanwhile, Team Sanders is citing its candidate’s general-election polling advantage over Clinton not just because it is appealing to electability-focused Democrats, but because it directly contradicts the informal but widely spread elite view that Bernie could become the worst-performing Democratic nominee since Walter Mondale. There is a consensus among political scientists and data journalists that really early general-election trial heats are not terribly meaningful. But how early is too early? Harry Enten of FiveThirtyEight argues that you should ignore general-election polls until after the conventions, which is when voters begin to think seriously about such choices and the candidates are beginning to make their electorate-wide appeals. On the other hand, general-election preferences are more stable than primary preferences, making big departures from the norm (e.g., Trump’s poor numbers) potentially significant. Are the smaller Clinton/Sanders differences worth taking to the bank? Truth is, polling data is often secondary in electability arguments. Scratch the surface and you’ll usually discover a broader hypothesis. Belief in Clinton and Kasich as the strongest general-election candidates reflects the traditional “median voter theorem,” which holds that candidates perceived as closer to the political “center” will, all other things being equal, perform better in a competitive general election. In Clinton’s case, those who believe that despite the current data she’s more electable than Sanders stress her long-term exposure to conservative demonization and figure Bernie’s general-election numbers would look worse than hers once the right-wing noise machine has had a chance to hammer away at the 74-year-old socialist with a mile-long congressional voting record on the left-most fringe of American politics. Meanwhile, despite being at opposite ends of the general-election data, Sanders and Trump rely on similarly unconventional theories of how they will win a general election. Both camps argue their champion will mobilize and bring over to his party marginal, discouraged voters left cold by centrist politicians. Ted Cruz has a narrower but parallel electability claim that tens of millions of conservative Evangelical voters will show up on his behalf in November. Now, under any of these theories, the polling data should at some point converge with reality, but when that has happened is obviously going to be a question people answer according to their underlying beliefs. Will a Clinton superdelegate who thinks Bernie Sanders is the new George McGovern be swayed by a June poll showing him running a few points better than HRC? Probably not. And it’s equally unlikely a Trump delegate in Cleveland facing a second ballot is going to defect over some negative general-election trial heats; Trump has, after all, defied expectations repeatedly, right? No matter what the numbers show, people on this or that “team” are more likely to use, abuse, and ignore them according to the team’s needs. And the rest of us, who are trying to discern objective reality, will probably have to wait until the fall to find out which numbers were relevant after all.